Each year we ask Santa for a number of really great sustainable gifts for the Province of Manitoba. Yet despite being good all year and really not naughty at all, we are still asking for many of the same things on our wish list. So with all due respect to Mr. Claus, we are sharing our ambitious 2019 list with the people of Manitoba and asking you to help us make our wishes come true! Since the Province of Manitoba has scrapped the carbon tax portion of Manitoba’s Climate and Green Plan, our wish is that the Federal Government keep the backstop in place and ensure fair distribution of Manitoba’s carbon tax, directing funds to green solutions for all Manitobans. Carbon revenues should be targeted toward technologies and programs that reduce or mitigate GHG emissions directly or provide alternatives to current practices, while low income groups and other disadvantaged people in Manitoba should be protected to alleviate the impact of the tax. We were glad to see a freeze on transit fares this year – thank you Santa! But we must continue to focus on safety, wait times, and better connectivity between routes in order to make public transit a preferred choice of travel and get more people out of their cars… In case you missed it, see what Green Action Centre’s Liz Shearer had to say in this article that appeared in the Saturday Winnipeg Free Press’s Green Page on December 16th, 2017. According to wikipedia – A modal share (also called mode split, mode–share, or modal split) is the percentage of travellers using a particular type of transportation or number of trips using said type. Green Action Centre wants to see bicycle, pedestrian, and transit mode shares go up, while the single occupant vehicle mode share goes down. Manitoba is a car-centric province, with 75% of people driving alone for their daily commute to work or school. If Manitobans want to reduce their carbon footprint, traffic congestion, and the economic burden of owning and operating a vehicle, we need viable options to replace our trips by car. GoManitoba is a ridesharing tool that matches you with potential carpool, cycling, walking, and transit matches, and also serves as a great place to start for resources, trip planning, and tracking savings. We need to prioritize the movement of people (of all abilities and ages) before cars. We saw a disappointing outcome for the vote to open Portage & Main this year, and it’s clear from the results that we have work to do as a City and Province to communicate the long-term benefits of building sustainable cities for people, not cars. The path we’re on now is leading us towards increased traffic congestion, air pollution, climate change, costs (personal and governmental), and more. See our blogs on the Portage & Main plebiscite (part one and part two) for the importance of city design for sustainability, accessibility, walkability and well-being. Our youth are living in a state of health and environmental crisis. 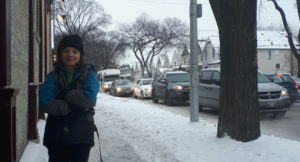 Two out of three children in Manitoba are not walking or cycling to school. There is considerable evidence confirming that children are put at a disadvantage when they miss out on active and independent outdoor play connected with active school travel. This includes an elevated risk of physical and mental health issues, less-developed motor and social skills, and reduced resilience, in addition to the environmental impact of unnecessary vehicle trips. However, to reverse the current trend, we require strong policies that reflect the immense value in active school travel, such as allowing and promoting independent travel to school in children under 12. Children and youth need to learn healthy and sustainable transportation while lifelong habits are developing. Green Action Centre is ready and eager to help out. To see how we can support your school community, visit our Active and Safe Routes to School Program page. As Greyhound services leave Western provinces, those who are left without need reliable and affordable options aside from owning and operating a personal vehicle. This is where GoManitoba’s ability to connect Manitobans to share the ride could play a crucial role through the single-trip matching feature. This online service enables users across Manitoba to connect with others to share a ride. Carpooling can help address the gap for Manitobans in rural and northern communities. Individual choices are very important, but we need structures that make it easy to make the right choice. If the Province of Manitoba can impose an increasing ban on organics in landfills in the Capital Region starting in 2022, our province will see a reduction in greenhouse gas emissions and have less need for ever-increasing landfill space. The City of Winnipeg has spent years discussing implementing curbside composting, which could divert potentially 40% of our waste from the landfill and reduce greenhouse gas emissions. 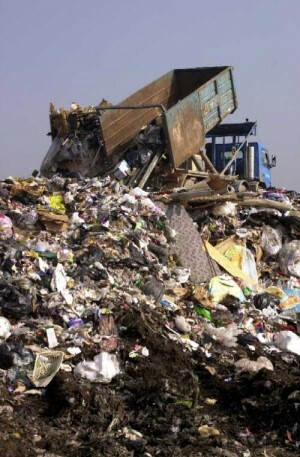 Currently we put just under 70% of all Winnipeg’s waste in the landfill. 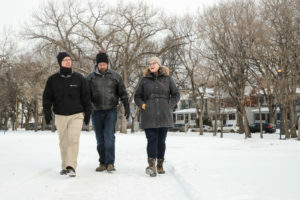 It’s time for Winnipeg to catch up to cities across the country (and province – props to Morden!) who have had curbside organics programs for years! We can all participate in this, every day! Take food waste: about half of our country’s wasted food is as a direct result of our choices. By eliminating all edible food waste, the average Canadian family could save $1,200 a year so it’s a win-win. Resolve to pick a category of waste you produce this year, and try to eliminate it – drink a lot of takeout coffees? Bring a mug, and talk to your coffee shop’s manager asking them for a change in their systems. Throw away a ton of food packaging? Try to find a lower-packaging alternative like experimenting with bringing your own container for bulk foods. Remember, the first “R” is REFUSE! This of course would include a ban on the distribution of plastics in Manitoba that have no means for recycling here or adequate alternative markets. And one more thing! 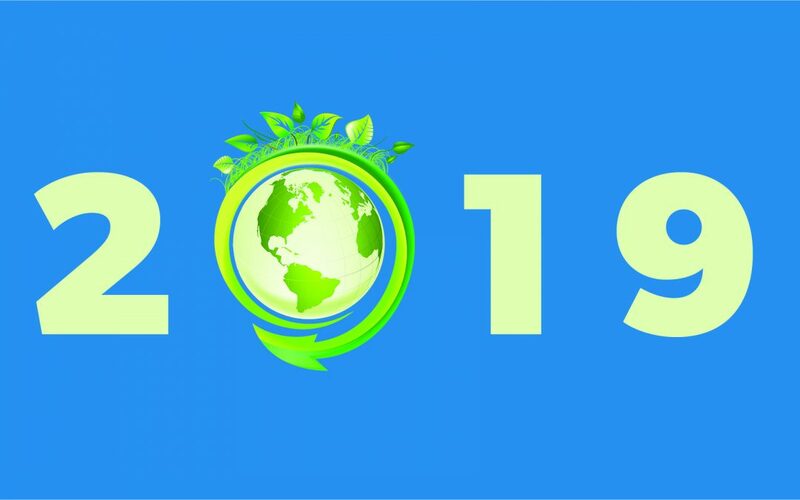 We wish all Manitobans an eco-awesome 2019, filled with healthy food, healthy transportation, and healthy practices. Reuse is a really important “r”! However, the traditional hierarchy is “reduce, reuse, recycle”, and we at Green Action Centre like to add a fourth R at the beginning – REFUSE! The waste reduction hierarchy needs to start with REFUSING and REDUCING our waste in the first place. Reusing is extremely important – but, you can only reuse an item for a finite number of times, and the resources have already gone into making it. That said, I think we can all agree that all the Rs are important and more work needs to be done in promoting each of them!